Classes will focus on restoring mum to health: a strong healthy happy mum will mean a happy, healthy baby. Please note baby yoga and massage is not included in this class. Babies needs do however come first so feel free to feed, change, cuddle or play with baby when you like. Each block must be booked and paid for in advance, sorry there are no refunds for missed classes. Good nutrition and movement are vital to rebuilding the body post pregnancy and to strengthen your body to deal with the challenges of being a new mum. Although women often rush back into high impact exercise and diet programmes this is not ideal for your depleted body. That is not to say that you can't return to high impact activity but a period of nuturing, healing and strengthening the body is recommended. Our classes will aim to help you to recover from all of the issues above, whilst also providing you with sound nutritional advice to encourage the body to heal whilst loosing weight. Rather than a crash diet I encourage you to make a life long change to the way you eat which will not only benefit you but your family as a whole. It is common for women to experience postnatal anxiety or depression; a supportive group, movement, nutrition and bonding with your baby may help. Movements will be specific to postnatal mums dealing with issues of pelvic floor, core strength, diastasis, back pain etc. As such classes will be small so that I can give individual attention; checking posture, diastasis etc. If you need extra support please feel free to book in with me for a one-to-one consultation. "The idea that two adults strike out on their own, away from all their support, and grow a family in isolation is new to human society. For millennia we lived in large family groups, tribes, or at least multi-generational homes. 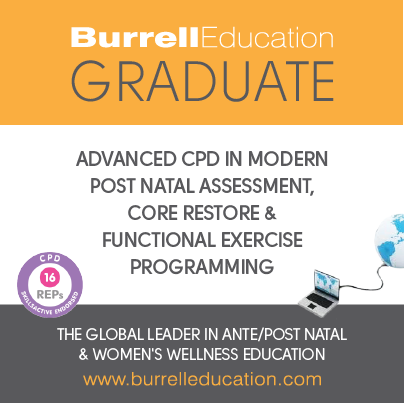 Having a baby was a group project"
'Post Natal Assessment, Core Restore & Functional Exerise Programming' Burrell Education.